We all do it of course when we are visiting somewhere new; we look in a guidebook and we research on the internet. They all can be great sources of information as can guided tours, but the trouble of course is there a risk we only discover the ‘top ten’ places to go and miss out on other wonders. Instagram it seems is making some tourists even less imaginative in their travels as everyone attempts to take the exact same photograph as that ‘100k liked’ one on their Instagram feed. And I know I have got caught up with social media finds too. Sometimes though it is positive, for example we would never have gone to Aveiro if it had not been for a post by Nelson Carvalheiro. However other times I have been so keen to visit something I had seen in a guidebook it has stopped me from even considering that there might be just as lovely alternatives. And so it was the case with Porto’s azulejo covered churches. I think nearly everyone who visits Porto will have a photograph of Igreja do Carmo (pictured above), since on Instagram I am regularly seeing clever shots of people standing at the traffic lights with the church behind. 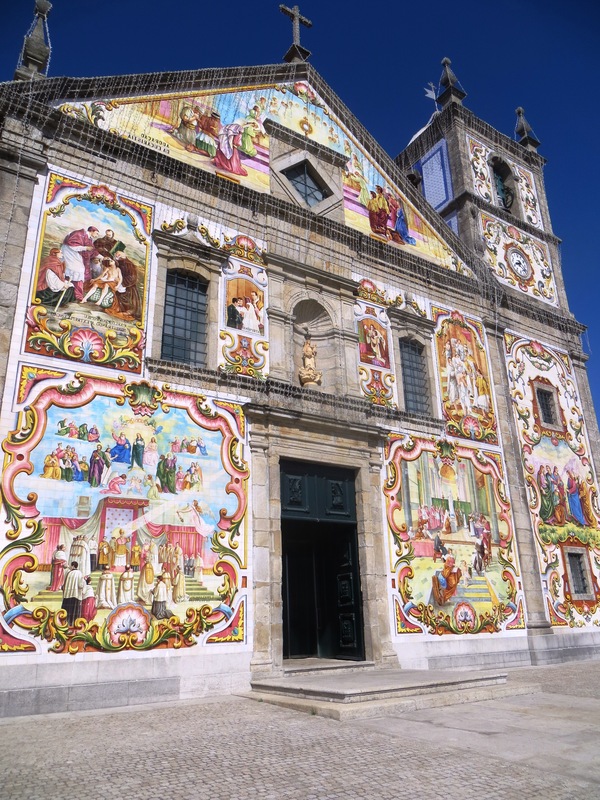 However it is not the only azulejo covered church in Porto, there are numerous other delights to discover such as Capela das Almas de Santa Caterina. The church is 18th century and was built on the site of a much older wooden chapel. At first glance you might think the tiles are of the same period given the painting style, however they didn’t appear until 1929. The 15,947 tiles were produced in Lisbon and are the creation of the artist Eduardo Leite. The panels depict the life of St. Francis of Assisi and St. Catherine. I thought a stunning building, and whilst it was a new find for me I am very aware it is probably almost as well known as Igreja do Carmo. So if you are heading to Porto anytime soon and love azulejos as much as I do, why not set yourself the challenge of finding a church that is lesser known! But it’s true, social media can destroy some imagination and keep us from actually exploring a place on our own. Wow, I don’t think I’ve seen such huge areas of azulejos, I have to go to Porto. There’s nothing better that getting off the beaten track and a bit lost! Never seen an azulejo covered church, but they are impressive. As for Andrew’s church!! Wow! It is hard to avoid the tourist sites, but if I have time (as in more than one day) then I will go off the beaten track and see what I find. Trouble is with the internet there aren’t many undiscovered places any more. Not many undiscovered places for sure but there are still a lot which are not completely overrun and spoilt. That’s true 🙂 and thank goodness there are. No, another place now on my ever growing list! and you are right the internet so good in so many ways, but in others . . . .and I know I am adding to the problem with this blog. You want to share but at the same time . . . . . . . I confess that I have a picture of that church. Wow Andrew! I am left speechless. So was I, well almost!! I am so glad that we are returning to Portugal this year, this time to visit the south. I have been to the Algarve before but have never crossed the mountains to go inland. Amazing!! Have to check it out once day!